The uses of Gum Acacia date back about 5000 years to the time of the ancient Egyptians, and it is the oldest and best known of all the natural gums. Among its many ancient applications, Gum Acacia was used as a binder in cosmetics and inks, and as an agent in the mummification process. Egyptian fleets shipped Gum Acacia as an article of commerce. Ancient inscriptions frequently refer to "KAMI", a form of Gum Acacia used as a pigment binder and adhesive in painting. It was eventually introduced to Europe through various Arabian ports acquiring the name "Gum Arabic" after its place of origin. During the Middle Ages, Gum Acacia trade was carried on through ports controlled by the Turkish Empire, thus giving rise to the name "Turkey Gum". An export trade was also developed for a time around Bombay – thus, "East Indian" or "Indian Gum". Gum Acacia senegal is defined as the dried exudate obtained from the stems and branches of Acacia senegal (Wildenow) or the related species of Acacia (Fam. Leguminosae). It consists mainly of high molecular weight polysaccharides and their calcium, magnesium and potassium salts, which on hydrolysis yield arabinose, galactose, rhamnose and glucuronic acid. Glycoprotein – 1% of the molecule and again nearly half of the polypeptide fraction. The majority of the commercial gum comes from Acacia senegal and Acacia seyal. The supply area is the Sahel region, a transition zone between the northern Sahara Desert and the southern belt of savanna. This area is seen stretching all the way from Senegal in West Africa to Somalia in East Africa. Strangely, Gum Acacia is only produced by trees that are in an unhealthy condition. Gum yields are improved by natural factors that lessen the vitality of the trees – hot weather, poor soil, lack of moisture, etc. It is important to remember that a damaged tree will give a larger yield of gum. Thus, the natives will cut and strip the bark from a tree and return later to remove the tears of gum that form in the wounds or scars. Within 3 – 8 weeks, the gum will start to collect in the wound, but this depends on the weather conditions. 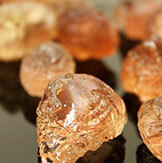 Gum droplets are about 0.75 – 3 inches in diameter, and they gradually dry and harden on exposure to the atmosphere. A young tree will yield 400 – 700 grams annually. The dry season lasts from October to June and the gum is collected every 10 days. During the rainy season no gum is formed since the trees are in full bloom. After collection, the gum is brought from the farms and stands to villages. From there it’s transported to market. When the gum is auctioned, there is a basic cleaning process including sieving, hand selection and grading. The main purpose of this cleaning process is the removal of sand, bark, extraneous material and any adulteration with other gums. Unlike the ancient Gum Acacia senegal the commercial use of Gum Acacia seyal is a very new and exciting development. An exudate of the Leguminosae family of tree, Acacia seyal has only been commercially available in the United States since mid 1988. 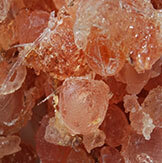 Prior to this it had commonly been used in its raw state as a confection in India. Although crude seyal had always been in abundant supply, in 1984 Importers Service developed the selection, purification and drying techniques to permit the manufacture of Spray Dried Gum Acacia seyal. Since these developments Acacia seyal has gained wide acceptance first in industrial applications and more recently in food and pharmaceutical applications for coatings, encapsulation, tableting and as a source of soluble fiber. Acacia seyal is now available from several other sub-Saharan African countries, notably Chad, where it is called "Gum Friable", and Nigeria, where it is referred to as "Grade No. 2". It is interesting that A. seyal is not harvested in the same manner as A. senegal. 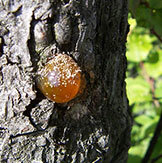 Instead of tapping the tree to develop the gum tear, A. seyal is exuded through naturally occurring breaks or fractures in the tree branches and bark. Historically, the gum would generally go unharvested, fracture, fall to the ground and be rendered unsuitable for most food applications. Importers Service developed the manufacturing process that changed all that. In the 1990’s ISC developed methods to decolorize the naturally dark Acacia seyal without damaging any of the attractive natural properties it possesses. This has opened a new market for Acacia seyal – applications which require a white powder or colorless solutions, as opposed to the brownish solids or coffee colored solutions of the past. Importers Service’s Spray Dried Gum Acacia offers a less expensive but effective alternative for many of the other Acacia and starch based products on the market today. Gum Karaya is the gum exudation obtained by the cutting of the stems and branches of the Sterculiaceae trees. As the world leader in Gum Karaya processing, ISC Gums, offers a large variety of Gum Karaya to suit your requirements. Gum Karaya is an all-natural product, harvested in West Africa and India, it has been used for centuries in traditional African and Indian cooking. 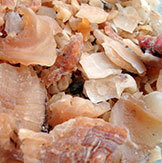 Today, Gum Karaya has a wide range of uses. Food and pharmaceutical industries as a; bulk laxative, adhesive compound, denture powder, meat binder, powerful thickening agent, ingredient in diet products (provide the user with satiety). Flavors as a; Stabalizer, texturing agent, ready-to-use dressings and sauces. Industrial; printing, paper and textile industries. 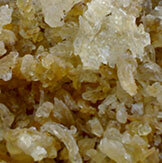 Gum Tragacanth is a natural gum which is obtained from several species of Legumes. It is drained from the root of the plant and dried. The gum seeps from the plant in twisted ribbons or flakes. It is viscous, odorless, tasteless and water soluble. It absorbs water to form a gel, which can be stirred into a paste. It has many uses. In pharmaceutical and food it is used as an emulsifier, thickener, stabilizer and texture additive. In industry it is used as a compound in leatherworking, stiffener in textiles and as a binder in artist pastels. Although not as common as other gums, Gum Tragacanth remains useful today as there are few alternatives. Gum Ghatti is an all-natural water-soluble complex polysaccharide. It is odorless with a bland taste. It is exuded from the Anogeissus latifolia tree of the family Combretaceae. The color varies from off white to dark brown. The lighter the color, the better the quality. It is hand sorted according to color and impurities into various grades. In the pharmaceutical and cosmetic industries it is used as a stabilizer in vitamins and oil water emulsions. In foods, it is used to stabilize syrups.